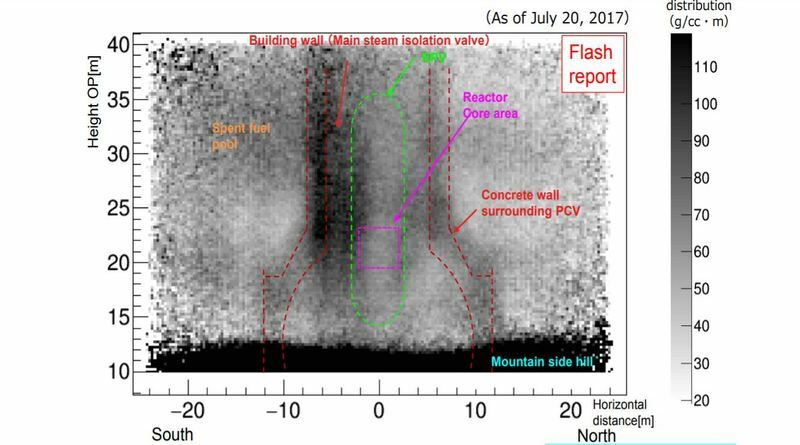 TEPCO announced late Friday the preliminary results of the unit 3 reactor muon scan. The muon scan is capable of detecting masses of nuclear fuel if they are over a certain size, usually at least a cubic meter or larger. The preliminary results of the unit 3 scan were published with a note that they will continue the scan. This continued scan would likely refine the data but may not drastically change the results. TEPCO admitted there is no significant amount of fuel inside the unit 3 reactor vessel. These scans do not quantify possible fuel lower in the containment structure or in the base mat concrete of the building. TEPCO & IRID recently completed an ROV inspection of the unit 3 containment structure including the pedestal area below the reactor vessel where melted fuel is expected to be found. This inspection did clearly located some melted fuel. It is currently not clear how much fuel was actually found in this area as the video and imagery published was limited and heavily edited. This information is key towards fully understanding the events at unit 3. Right now it is clear that no significant amount of fuel remains in the unit 3 RPV.